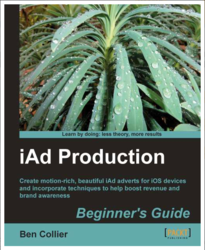 Packt brings to you its first ever publication on iAd with the all new iAd Production Beginner's Guide book and e-book. Written by web designer and mobile application developer Ben Collier, this book enables readers to create interactive iAd mobile adverts that appear in applications downloaded from the App Store. iAd Production Beginner's Guide: Published! iAd is a mobile advertising platform developed by Apple Inc. for its iPhone, iPod Touch, and iPad line of mobile devices allowing third-party developers to directly embed advertisements into their applications. This book will take the readers through the process of creating full-screen HTML5 banners for the iPad by using Apple's templates which focus on the visual impact of ads. Once these ads are created, the developers will also be able to submit and track their campaigns with Apple in the iAd Network. Competitively priced at $23.99 (e-book) and $44.99 (book), this guide provides effective ways of generating revenue and brand awareness with ads that are created, using tools like store finders, digital downloads and virtual coupons. Packt Enterprise is a publishing division of Packt Publishing designed to serve the information needs of IT Professionals in the Enterprise space. Packt Enterprise also publishes on Microsoft, Windows 7, ASP.NET, Oracle, Citrix, Java, Amazon, Google and SAP technologies.